19th August Rod Amos The Sun Worshippers. Rod Amos spent most of his work­ing life as a doctor spe­cial­ising in rheum­at­o­logy and arth­ritis at the Children’s Hospital in Sheffield so was there a con­nec­tion with his talk? Could sun wor­ship be a treat­ment for these crip­pling con­di­tions? Well, if there is, then it cer­tainly didn’t come out in his fas­cin­at­ing and detailed talk about the Sun Gods of Egypt! 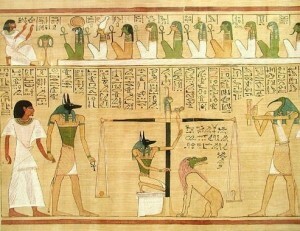 Sun wor­ship was pre­val­ent in the ancient Egyptian reli­gion. 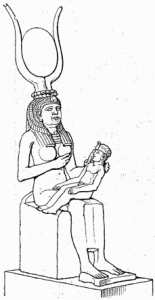 The earli­est deit­ies asso­ci­ated with the sun are all god­desses, includ­ing Hathor, Nut, Bat, and Menhit. Hathor, and then Isis gave birth to and nursed Horus and Ra respect­ively. Hathor – see pic­ture – the horned cow is one of the 12 daugh­ters of Ra. Their belief in the birth life and death sequence was reflec­ted in the pas­sage of the day itself, start­ing with dawn and moving on through to the night. 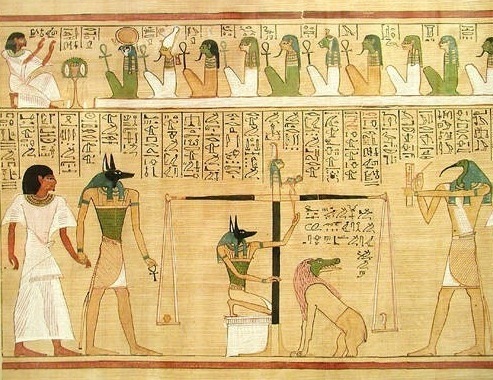 In the stor­ies of the Egyptian Gods there are many sim­il­ar­it­ies with the Christian stor­ies of Adam and Eve, Cain and Abel and the great flood for which Noah built the ark. Sitting between the Gods and the people were the Pharaohs. Egyptologists have long debated the degree to which the Pharaoh was con­sidered a god. It seems most likely that the Egyptians viewed royal author­ity itself as a divine force. Therefore, although the Egyptians recog­nized that the Pharaoh was human and sub­ject to human weak­ness, they sim­ul­tan­eously viewed him as a god, because the divine power of king­ship was incarn­ated in him. Rod covered many aspects of the beliefs of the Gods and Pharaohs and none more strange than the weigh­ing of the heart against a feather –if it was too heavy then entry to the after­life was not per­mit­ted. Previous PostJames Chesterman And Their Measuring Tools — Jim NicholsonNext PostFulwood member comes home!